Society says people should completely fall apart after a breakup, but everyone deals with heartbreak in their own way. 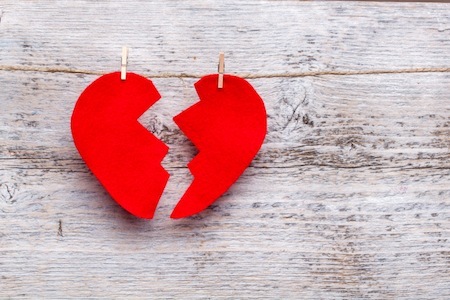 I recently sliced my heart wide open and found a horrible cliché: that I loved my partner dearly but was not in love with him. My ex-boyfriend’s belongings are still haphazardly strewn throughout the apartment in boxes and bags and bins. I still smell his scent wafting through the air, the alchemy of Old Spice and Camel cigarettes. I keep finding his socks behind the beige chair that I hated so much but the cat loved. I wanted to move all of his stuff to the garage but decided against it. It would not be fair to either of us. I could not stow these belongings neatly in boxes in the garage. I could not remove these physical manifestations of him and his soul from the apartment and forget, nor could I start over that easily. With mouths agape, people ask me what happened. What went wrong? They said we just seemed, well, so happy. They said we would get married and make babies. We were 27 and invincible and oh-so-in-love! I wrote stories and poetry about him. He swooned me on guitar. But we had a mature, amicable break-up, and it’s all wrong. Society writes a script that all failed relationships capsize amidst a title wave of pain, anger, sadness, and drama. Surely scorned lovers must be a result of a woeful Shakespearean tragedy addled with infidelity, addiction, bankruptcy, or public humiliation. My heartbreak was subtle, gradual, and private. Yet it hurts and burns just as badly as a tragedy. I want so badly to say this winter is to blame. It has been below zero 138 days in a row in the silts of the Red River Valley we crazily inhabit where a gust of wind freezes the marrow right within our bones. But I think that’s all wishful thinking. I think I felt this way when the wind grew from a whisper to a howl and pointed its fangs at me, the seasonal depression hitting both of us with a vengeance. I swallowed my anti-depressants and sat in front of my fake sun and hoped he would follow suit for his own peace of mind. I wanted him to be happy so badly. I kept waiting for something to come, hanging on to an ever elusive, dangling thread of hope that felt just beyond my outstretched fingertips. Yet I no longer eagerly ran to the door when I heard his footsteps approaching. I tip-toed home at 3am after nights out with friends. I spun away from his dark orbit. I spent more time out of the apartment than in it. He made no effort to spin me back—cook me dinner, take me on dates, or write me romantic letters. I yearned for some romance in my life, to be craved and desired, not just needed. Breaking up with him has been one of the hardest things to do, but also liberating. I had to listen to the quiet gnawing voice that grew louder and louder with time that told me we needed to be apart. Although we loved each other dearly, we were no longer growing together or challenging ourselves. Society’s scripts say that in order to end a relationship, we must be in shambles. I should have been sobbing in bed consoled by a pint of Ben and Jerry’s, watching Romeo and Juliet or the Notebook on repeat, calling in sick to work. But I decided to flip this script and embrace my feelings of liberation—laced with the pain—and I have taken solace in my job and my co-workers. My heartbreak means staying out all night at a bar for a friend’s birthday, mingling and dancing. It means eating my favorite dinners for one by candlelight. It means singing in the shower shrill and off-key, and splaying my body across the bed in defiance. This is what heartbreak looks like for me, and I don’t feel guilty for not unraveling.